I'm excited to begin work on February's mask! It's been a long time since I've been able to craft because of general life challenges, but I'm happy to dive back in for this project! While I'm a painter by day, crafting is my relaxation hobby that allows me to experiment creatively in a different way than painting does. I'm a lover of everything of the Art Nouveau and Arts & Crafts movements. They were inspired by organic and naturalistic beauty and created lovely floral designs. I wanted to bring something of that aesthetic to my masks. 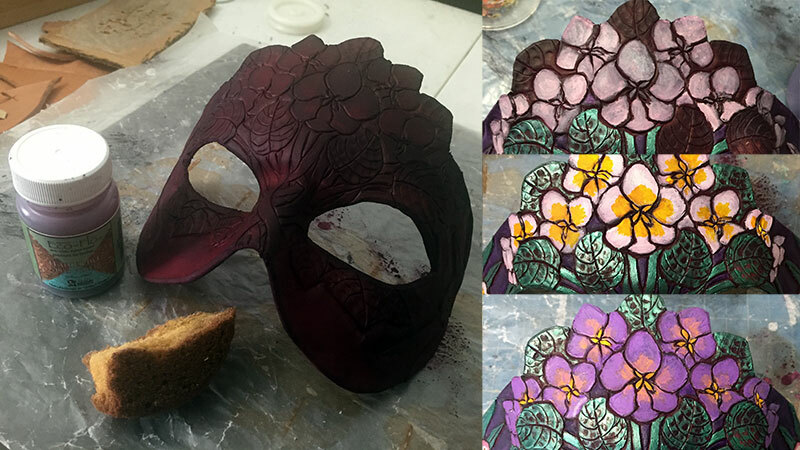 February's mask will be purple, like the Amethyst birthstone for the month. 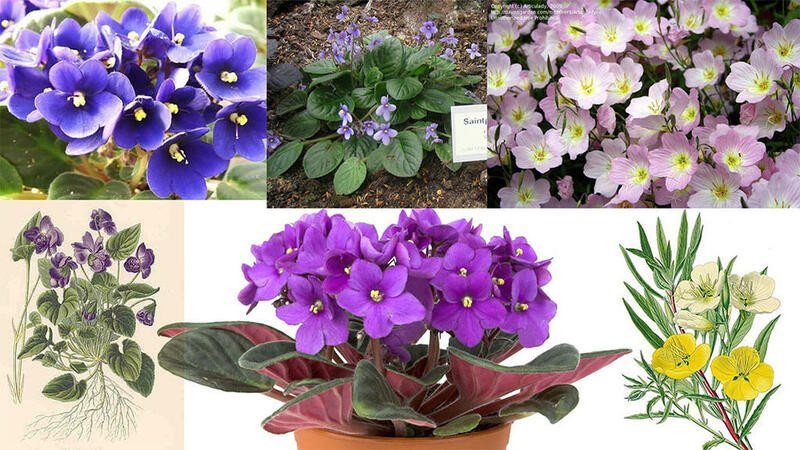 The February birthflowers are violets and primroses. Before I begin, I study botanical drawings and photos of the birthflowers to get a better sense of how I can abstract them. For example, I take note that the shape of the violet flower is hexagonal, which will be useful in simplifying them later. I usually like to begin my design process by using a croquis (essentially a mannequin form that is repeated) and exploring various location for the design elements. 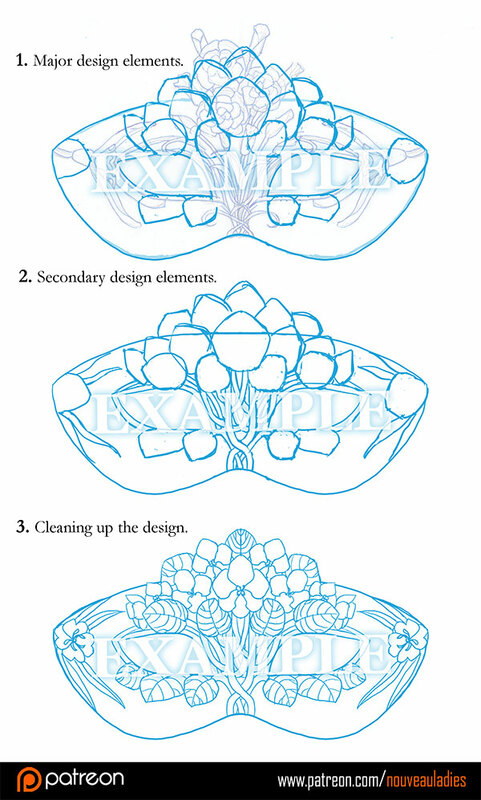 Here's another example of my design process utilizing the croquis figure. I also offer a downloadable croquis for others to use here. However, with this particular mask design, I wanted to echo the original January mask's elements so that the entire series of month masks will look cohesive. With that in mind, I simply drew my design motif directly on top of January's pattern. Working in Photoshop CC, I started drawing my new design in a layer atop the original pattern for the January mask. 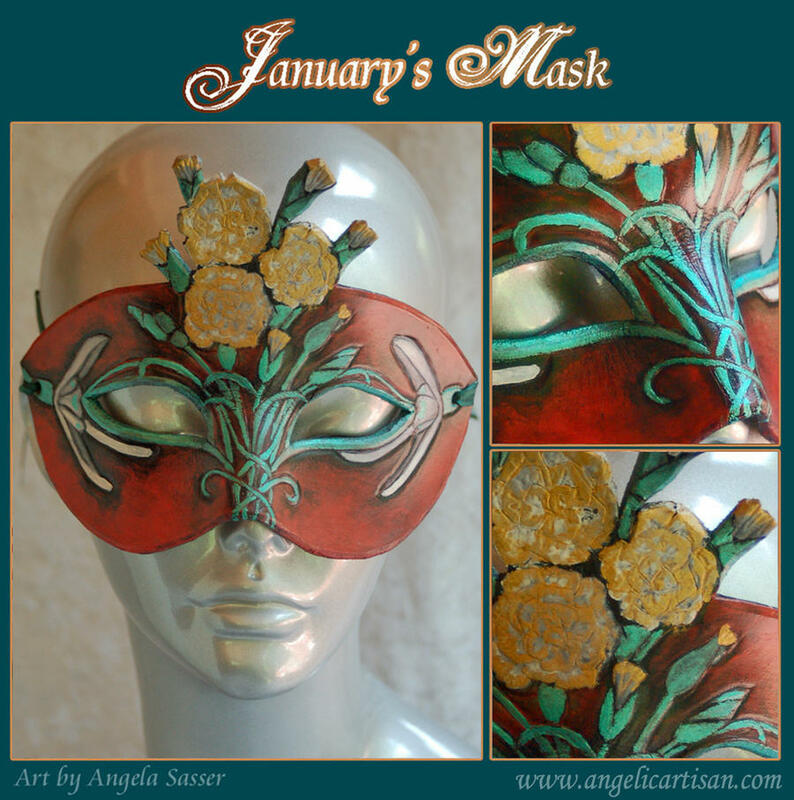 The first thing I lay in are the major shapes of the flowers, spacing them out in such a way that the design has breathing room and isn't too busy while echoing the layout of the January mask. The blooms of the Violets and Primroses plus the large round shapes of the Violet's leaves lend themselves well to this purpose. 2. Secondary design elements. The stems and long thin leaves of the Primroses act as my secondary design elements, allowing me to have fun with overlapping knotwork-type lines that let me abstract the flower stems into a decorative element. These elements also repeat the shape of January's Snowdrops and stems for continuity. 3. Cleaning up the design. On a new layer above the sketchy layers, I actually copy and paste half of the design and mirror it so I don't have to redraw part of it. Then, I clean up the design to create slightly asymmetrical overlaps, especially in the bridge of the nose, which is generally the most interesting area of any mask design that people focus on. I have an interactive list of tools and materials here. 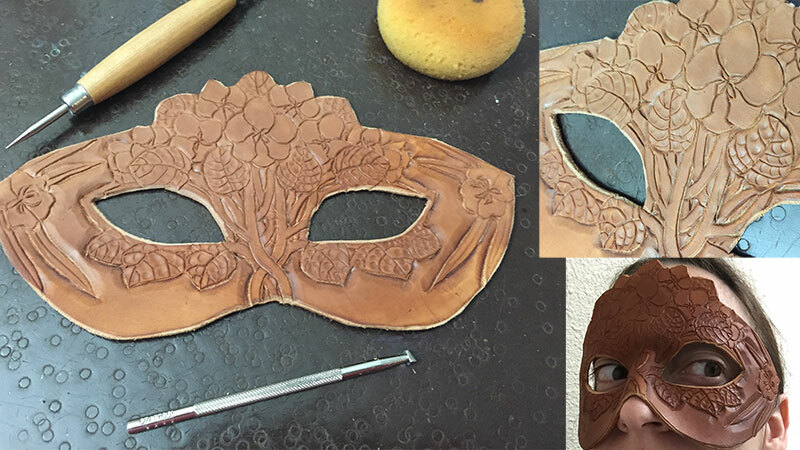 The mask design is printed out and transferred onto the leather by tracing with a pen. The pressure of tracing transfers the design onto the dampened leather. The design is then cut from the hide with leather sheers. I then tool the leather after casing it over night. Casing involves dampening the leather and leaving it wrapped in plastic wrap all night so that the leather absorbs the moisture and becomes optimally receptive to receiving impressions. I use the bevel stamps and modeling spoon to press in the designs and shape them. The edges of the mask are also rounded and smoothed to create a nicer edge. Once tooling is complete, I soak the mask in water completely then bake it in the oven at a low temperature. Every few minutes, I take the mask out and shape it, pinching the nose and curving it where needed. Parchment paper is used to prop the mask in the oven and protect it from being scalded by the oven rack. I first dye the leather with leather dye, which makes for a smooth even undercoat that primes the surface for painting with acrylics next. Where I want more vibrant colors, I first paint a coat of white before I paint on the proper colors. Once I'm done painting, I give the mask a light coating with a workable spray fixative to keep the dyes from coming up when I paint the varnish on. The mask is sealed with Liquitex Satin varnish, which preserves the metallic and matte textures and provides extra protection. Sticky back moleskin is applied in key places on the back of the mask to heighten the comfort. I then finish it all off by punching holes where ribbons are tied through so the mask can be worn on the face. Finally, the mask is signed and numbered with a woodburning tool. 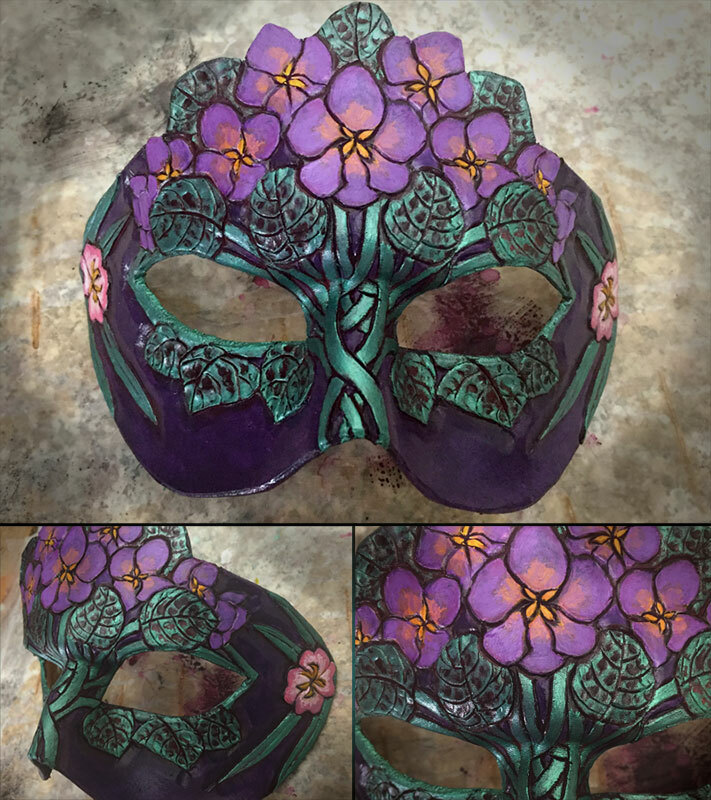 Enjoy this early look at the completed mask for Lady of February! If you'd like to pre-order this mask, you can do so via the Mask Collector tier over on Patreon. After Patreon pre-orders are processed, the mask will be made available to the public at my Etsy shop. Because this is such an intense mask, only 10 of them will ever be made! 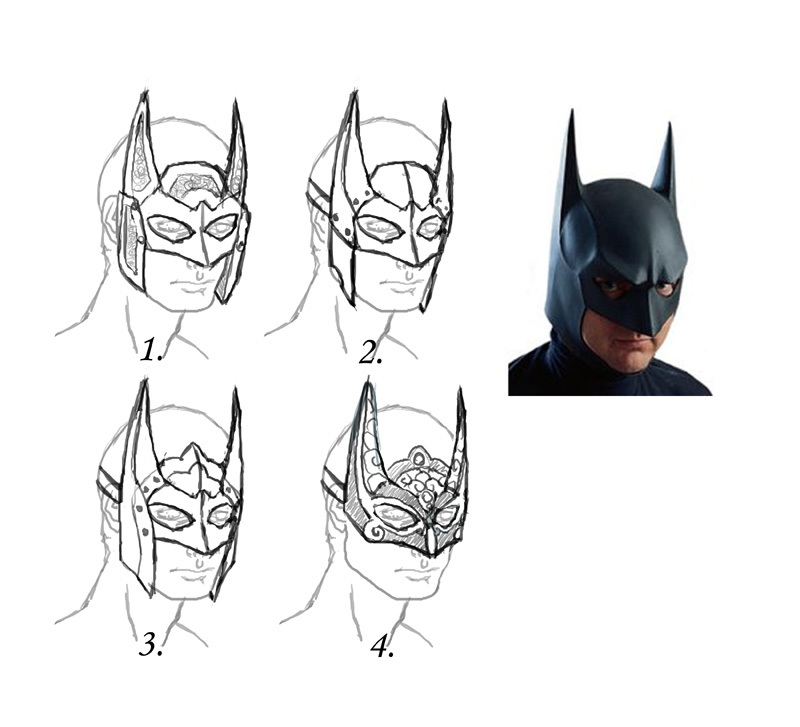 Want a more in-depth tutorial of this mask's process? Upgrade to my Premier Patron tier on Patreon to access the PREMIUM video tutorial for a narrated step-by-step look at my crafting process!